5 CDs. 5:14 hrs. Listening Library. Jan. 2018. $45. ISBN 9780804168021. digital download. Gr 5–8—When strangers initially meet six-foot, four-inch Little Charlie Bobo, they often mistake the 12-year-old boy for a man. After his father's death in an accident in the summer of 1858, Charlie finds himself facing adult responsibilities and decisions. When the devious, heartless Cap'n Buck arrives on Charlie's doorstep demanding repayment of a 50-dollar loan, the youth agrees to the man's offer: accompany him from South Carol-liney to Detroit and Canada to recapture thieves—former slaves of Massa Tanner. During their journey, the wool lifts from Charlie's eyes and his ever-pondering mind begins working overtime to see past the lies he'd been taught and to right a terrible wrong. Narrator Michael Crouch superbly tackles the difficult dialect, Charlie's pendulum of emotions, and the pompous, slimy Cap'n Buck. 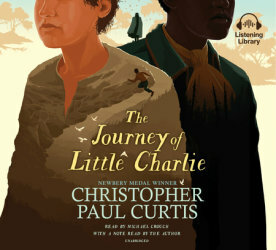 Curtis's young protagonist will sow the seed of courage in listeners with this heart-wrenching, and at times gut-wrenching, reminder that we must learn from history. VERDICT A "gay-run-teed" great listen and top pick.